Kevin has a passion for the theory and foundation of law, as well as for its practical application. After earning a graduate degree in philosophy with an emphasis on ethics, Kevin knew he wanted a career where he could work with the issues he had studied. He had a special interest in bioethics, which made health law a perfect fit. Kevin focuses his practice on healthcare regulatory and compliance issues, as well as healthcare fraud and abuse. After graduating from the nation’s top health law school, he served as a legal services fellow with BJC HealthCare, one of the largest nonprofit health systems in the United States. The highly selective program gave him the opportunity to see healthcare law in practice from a variety of angles, including labor and employment, risk management, physician contracting, real estate, and Medicare reimbursement and compliance. 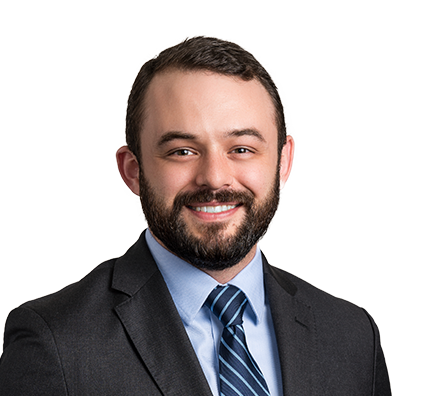 Kevin’s theory background makes him a detail-driven professional who sees and understands the finer points of healthcare law and regulations. He focuses on legal issues so that clients can focus on their patient care mission. He enjoys running at Tower Grove Park and Forest Park in St. Louis, while outside of the city, he enjoys fly-fishing. He also plays the guitar. Kevin spent a year after college living in Germany, near one of the longest remaining sections of the Berlin Wall. He developed an interest in the country’s culture and language and hopes to return for a visit soon.